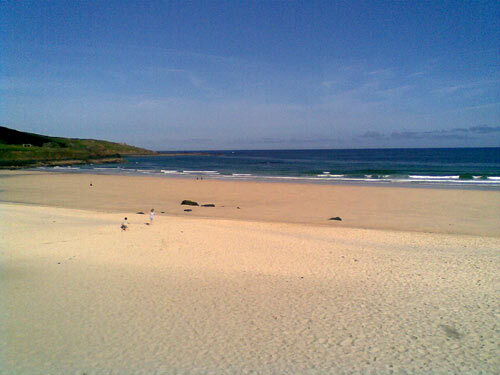 The above beach is the view 5 metres from my front door while on holiday. Nice, eh? Anyway, the point about this post is that Cornwall seems to be a law unto itself, when it comes to produce. One of the advantages of coming somewhere like Cornwall is that the fish in all the restaurants is all local and caught that day. What’s a bigger surprise is that a lot of the produce in the supermarkets – and I even mean the likes of Tesco – is also Cornish. They make great play on selling Cornish potatoes, Cornish strawberries, Cornish milk… the list goes on. Living in London, you’re hard pushed to find anything from within the M25 on the supermarket shelves. Chef Oliver Rowe managed to open a restaurant, Konstam, based on just such a principle for all his ingredients, but he found it pretty tough. Now clearly London is an exception, but C’s mum lives near Shrewsbury, a mere spit from the Welsh border, but can she ever find Welsh lamb in the shops? Of course not! More power to food miles and metres (as one shop in St Ives boasts) – I just wish it applied to places other than Cornwall sometimes.